Apple's stock price tanked nearly 10% in after-hours trading after its Q1 results and Q2 guidance significantly missed analyst expectations. The guidance, in particular, seems to have spooked investors as Apple announced their intention to provide a realistic guidance, as compared to the usual "sandbagging". 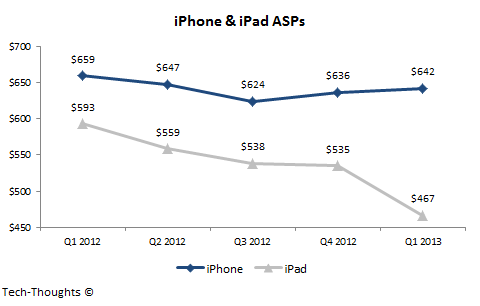 Let's take a look at the ASP movement chart and benchmark our previous iPad Mini cannibalization estimate. The shipment chart above clearly shows that iPhone growth has slowed during the current product cycle, thanks to market saturation. This should give Apple even more incentive to launch a cheaper iPhone. In contrast, the iPad has seen reasonably strong growth, but as I predicted, iPad Mini cannibalization seems to have pushed Q1 shipments below market expectations. My iPad sales estimate ranged from 24.5-26.2 million units, with iPad Mini cannibalization in the 50%-70% range. At this point, I'm virtually certain that the higher end of my iPad Mini cannibalization estimate was accurate, but I seem to have missed something. In light of the limited iPad Mini supply, I had applied my cannibalization estimate on just iPad Mini sales and not iPad Mini demand, i.e. I inherently assumed that the iPad brand would cause the potential "cannibalized" iPad Mini buyer, to buy an iPad 2/iPad 4 in case of short supply. In hindsight, that seems to have been a silly assumption. It looks like those particular iPad Mini buyers either delayed their purchase or purchased a competing product (most likely a comparable & cheaper android tablet). Given my previous analysis, this is the only explanation I can think of for iPad sales coming in at 22.9 million. 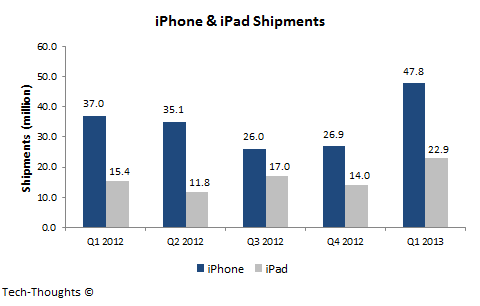 Market share figures for this quarter and iPad shipments over the next quarter should shed more light on purchasing decisions. If a majority of potential iPad Mini buyers delayed their purchases, we should expect the iPad to hold a 50%-55% market share this quarter and iPad sales should remain strong or post a modest decline in Apple's fiscal Q2. If a lot of those buyers opted for competing tablets, we should see Android tablets overtake the iPad's market share this quarter. A smart vendor, Apple, does not live in the past (high margins). They embrace reality, give the market the product and prices required.